We're getting little holes out of our rose leaves. What's doing it and how do we stop it? 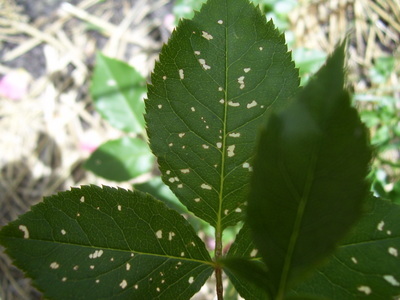 Think this may be capsid bug spray new leaf growth with systemic insecticide ie Roseclear .Pick off affected leaves and burn or dispose of - do not add to compost.You sure have a selection of pests! And that's what's got my valerian! « If I plant bomboo in my garden will it take over?